Annexx is a great resource for yourself, and your business, and getting started could be a little confusing. This tutorial will easily walk you through every step for creating your account and getting your business up and running swiftly. Visit the homepage here and click on the highlighted area shown in the picture below where it says “Sign Up” in the upper right corner. 2. When Prompted after clicking on Sign Up, you can either create an account using your personal email address, or sign up with your google account. 1.The first thing you’ll be prompted to do after logging in is choosing what kind of profile/business you’ll be using. You can choose more than one option, or none at all for now, the next time you log in you will get the prompt to choose if you’re having trouble deciding how to represent your business right now. 2. When you’ve made your choice, it’s time to start setting up your business profile. Go ahead and click on your name in the top right corner and it will bring your to your profile. Depending on what you chose to represent yourself as, there will be a couple different options you can choose from to help you build your business. Below I have attached a color coded picture with descriptions of what each feature will do. I recommend signing up for these features immediately, as the faster you do, the faster your business will grow. 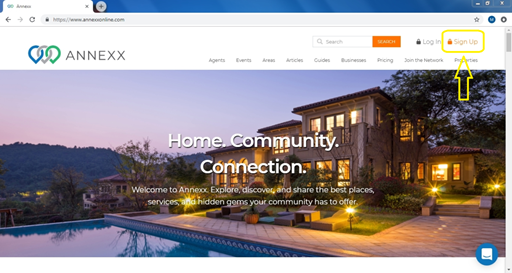 Black: IDX Access, This allows you and your clients to view/share current listings, save searches, view your active/pending/sold listings and current rentals, and show the most recent open houses. This feature is useful for all Realtors who wish for a clean all-in-one network to view and share their listings with clients. There are many different sub-features within IDX Access. After clicking “Yes, Sign up!” you will be brought to a prompt that will request some information about you and your credibility as a Realtor/Broker. Before signing up you will need to prepare to input your Agent Name, DRE Number, Broker Name, Broker Email and your Flex MLS Personal ID. Once you’ve input all of your information click “Request Access” and you will soon be able to access these features. I have included an example of what your page will look like after using IDX Access below. Properties, listings and open houses listed on your profile in a clean, aesthetic list including pictures, pricing and information. 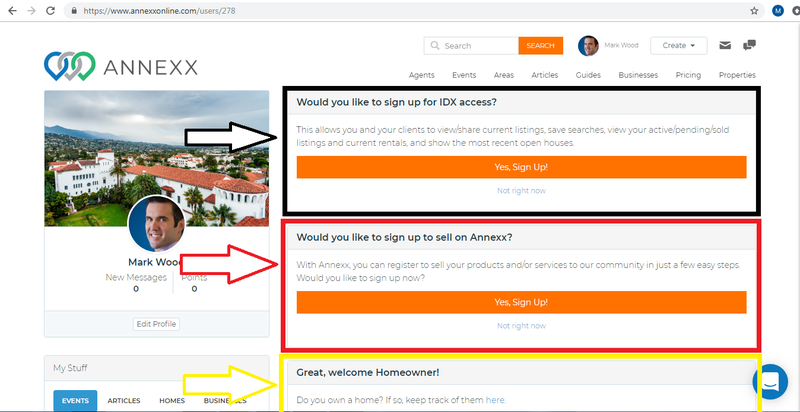 Red: Selling on Annexx, With Annexx, you can register to sell your products and/or services to our community in just a few easy steps. If you are a business or an entrepreneur looking to get your product or services out to your community, Annexx is an amazing place to showcase what you have to offer. Sign up for this feature and you’ll be brought to a page with a few questions about yourself, product and/or service. You’ll need to input your name, email, what kind of business you are from the large selection, area(s) of service and address and hours if that applies. If you’re a homeowner looking to showcase/keep track of your property click “here” under this category, in this area you can manage all of your properties/rentals. Once you click “here” you can create new homes for you to manage. If you’d like to bring something else to the community around your area, you can write an article; this can be about businesses, activities, schools. Anything you put your mind to can be made into an article. You will then see options at the bottom where you’re able to choose four different pictures; these will all be public on your profile so choose ones that represent yourself well. For your profile picture, I recommend you use a professional picture of yourself that looks inviting. For your company logo, if you are represented by a company, ex. Realty, this is the place to add that logo. Your personal logo is if you have your own logo, this can be something that you designed yourself, or we can design for you! Once you’re done, press the orange button that says “Update Profile” at the bottom and you’re all set! 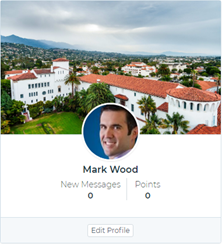 You have now created an account, chosen your business and updated your profile! You’re now ready to use all of Annexx’s useful assets and features at your leisure.